It seems shop owner and newly appointed Whispering Falls Village President June Heal has it all: Beauty, wits, bewitching powers...Sheriff Oscar Park. Life is good. Because life in Whispering Falls is magical. But when a member of the community is found dead on the steps of A Charming Cure, June's homeopathic cure shop, and her fingerprints show up at the scenes of local robberies, she is kicked off the village council and her powers fall under scrutiny. Until it's uncovered who is wreaking havoc on the town...June's magic is suspended. With the help of a rather obnoxious genie and Mr. Prince Charming, June's Fairy-God cat, June is determined to figure out who is framing her. Time is of the essence when it becomes clear that the true villain is trying to get rid of her...permanently! Oscar Park will do anything to protect June even if that means giving up all of his magical powers. . .or worse, his life. My Review: It's no secret I'm a huge fan of Tonya Kappes. Her books never fail to be fresh, fun, and pure magic. 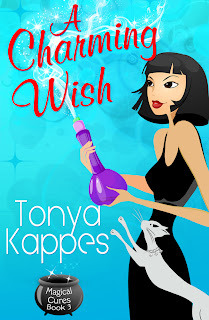 A Charming Wish is my third visit to the mystical village of Whispering Hills, and with each book this special setting and it's charming yet wacky inhabitants have become a favorite of mine. In this book the hysterical Karima sisters get not one but two fresh bodies to prepare at 2 Sisters and a Funeral! A purple genie, an ostrich, and even Ding Dongs play central roles in this enchanting cozy. Tonya is an Amazon Movers and Shakers, and self-published International bestselling author. She writes humorous cozy mystery and women’s fiction that involves quirky characters in quirky situations. Carpe Bead ‘em is a the winner in Amazon’s eFestival of Words in the Women’s Fiction Category. Become a member of Tonya’s STREET TEAM! It’s a gathering place of readers who love Tonya Kappes novels and Tonya gives away monthly prizes! To sign up for Tonya’s STREET TEAM, newsletter, view book trailer, and upcoming news, check out Tonya’s website, Tonyakappes.blogspot.com. This sounds like such a cute series! I really need to start reading more cozies! Especially paranormal ones...My Favs! Thank you so much!! I'm so glad you liked it! I've read the first two and am almost through with A Charming Wish. I'm loving it so far with the exception of what's happened to Oscar. That better work itself out. I love this series! It's fun, light, and entertaining. Whispering Falls is full of quirky characters. This is a great series to pick up ... and a steal at under $3 a ebook.